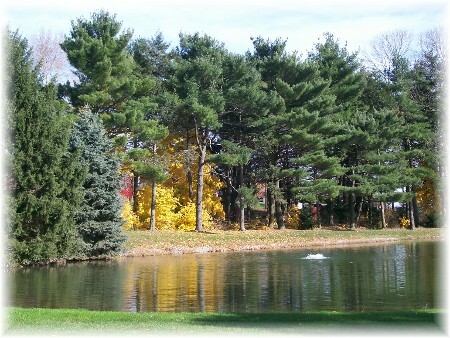 To the left you can see the pond from the photo we used yesterday. Listen to us share this message on your audio player. "You, however, know all about … my purpose" (2 Timothy 3:10). I have always been a curious person regarding a wide variety of subjects. When I was little my mother nicknamed me "Curious Stephen" since I was always asking questions such as, Why did they name it that? What does that part do? How does that work? I continue to be inquisitive to this day and really hope I never lose it, although Brooksyne reminds me that it can annoy some people! As I think about it, my mother was very inquisitive and I most likely inherited this personality trait from her. Growing up, I asked her many questions, but in her senior years, the tables were turned and she was always asking me questions. And I must admit there were times that her many questions could start to annoy, especially when I would say "I don't know the answer" and she was sure that I did! One underlying question I often ask myself is, "What's the purpose for that?" That's a vital question for why we exist. God created with purpose. One of the greatest innate needs common to all people is a purpose for our being. Many aimlessly drift throughout their lives with little sense of direction or purpose. As a young Christian I learned to share my faith using a booklet called "The Four Spiritual Laws" which begins with the phrase, "God loves you and has a wonderful plan for your life." Of course the noun "plan" can be equally understood as "purpose" and truly God has a purpose for each one of us. 2 Timothy is considered the last letter that Paul wrote. The first nine verses in chapter three list over twenty-three godless characteristics evident in a period that Paul describes as "terrible times in these last days." In fact it could easily be a description of the world in which we live. He sums the list up with this phrase, "these men oppose the truth." But beginning in verse 10 Paul lists a number of positive personal characteristics that Timothy had observed in his life and thus was well acquainted with. "You, however, know all about my teaching, my way of life, my purpose, faith, patience, love, endurance, persecutions, sufferings—what kinds of things happened to me…the persecutions I endured…" (v. 10). Paul demonstrated these characteristics day by day; during periods of peace and during times of testing, when he had plenty and when he was in need. It wasn't just the words Paul used to teach, but it was his way of life that reinforced that which he professed. Among the characteristics he listed was "my purpose." The word purpose means a "plan" or a "resolve", denoting that a decision has been made. Another reference states this purpose to be, "the guiding motive of my life and work." God has a purpose for each of us. There are aspects of this purpose common to all of us who follow Christ. Although we may not all choose to word it the same way, it would be very similar to my Personal Mission Statement that I wrote many years ago. It could also be called my Personal Purpose Statement. I purposefully place it in the footers of each daily encouragement message. It reads, "I am created by God to bring Him glory. Through God's Son Jesus Christ I have been redeemed and I make it my life's goal to please the Lord. My mission in life is to honor God through my faith and obedience and to prepare myself and all whom I may influence for eternity." But I believe God has also specifically equipped each of us for the unique purpose He has for our life. This purpose varies depending on the gifts, callings, and challenges God has granted to us. In Acts 12:36 we read, "When David had served God's purpose in his own generation." My goal is to serve God's purpose for my life in my generation. What about you? • Do I know my main purpose in life, both general and specific? • Do the people who know me clearly observe me living by my purpose? • Do my priorities in life reflect this purpose? Daily Prayer: Your purpose in my life, Lord, is seen in a multitude of ways; whether it is in my vocational training; in the way I raise my children; in the relationships I engender or in the way I use my gifts to touch other lives. But Your purpose in my life is most visible to others in my response to heartache, betrayal, disappointment, suffering, and loss. Your purpose can be seen when I choose not to repay evil for evil, but rather good for evil. Lord, as I keep Your purpose for my life always before me I will remember that much good spiritual fruit can be developed in me in the ups and downs I encounter today. May I be faithful in making choices today that reflect Your purpose in my life. Amen. Brooksyne's Note: On Saturday, after a ladies breakfast, five of the women rode with me to visit Naomi Wolgemuth, a lifelong member of our church who is now at Messiah Village, a nursing home near Harrisburg PA. Naomi is holding a harmonica which she played for years in our church. It has four mouth pieces, all in different keys. I could tell from that model that she was a serious harmonica player at one time, besides hearing the many stories about her playing in the services. After we gathered around the piano to sing some Thanksgiving hymns she asked Bev (left) to get her harmonica from her room. At first she just made noise (and I thought, "What a shame. She can't play it anymore.") Then she asked me to play "Jesus Loves Me". When I played the first line she began to play along. It was beautiful and inspiring. She had such a good time. The workers and residents who looked on said they had never heard her play before. One aid said she had never seen Naomi smile so much. She began playing song after song, perfectly. Once again the old proverb true for me, "He who refreshes others will himself be refreshed." We were all refreshed by this joyous time together. Our visit with Naomi made me think of Herb Basso, from our church in Taunton, Massachusetts who also played the harmonica. Here's a version (mp3) of "Be Still My Soul" with his beautiful harmonica accompaniment. Peter DeHart is a friend from our church who has an interest in antique musical instruments. My sermon on Sunday was on the Lord's Prayer and Peter shared a version of the Lord's Prayer song on his Victrola made in 1919! 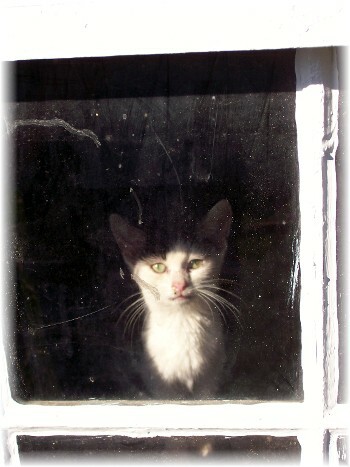 This little kitten is longingly peering out the window of a small utility shed on a farm we visited Sunday. Ester wanted to pick him up and I have a feeling he would have instantly purred! 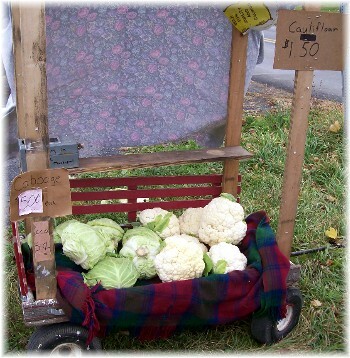 As the weather gets colder we are seeing less and less fresh home-grown produce available at roadside stands, but we stopped at this small wagon with cabbage and cauliflower. Notice the "honor system" self service box on the shelf. Last night Brooksyne made delicious cauliflower soup and today we will have fresh cole slaw. How Stuff Works This is a website I enjoy! Also this one. to enrich the spiritual impact of the Thanksgiving holiday. "Thankful For The Thorns" - A family reading and exercise that is a wonderful way to give a thoughtful focus around your Thankgiving Table (printable webpage) The Thanksgiving celebration includes family coming together along with the turkey and trimmings. Often there's a lot of food with little meaningful conversation. Why not add some stimulating discussion about the ways God has worked in your life over the past year! 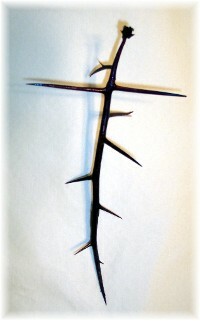 Some of you are not in charge and are only visitors at your Thanksgiving gathering, but if it is possible share together around the table the theme of "Thankful for the Thorns" or the questionnaire we've provided in the link below. A Thanksgiving family exercise - We have used this questionnaire as a stimulus for discussion among family members in the past. We encourage you to share results around the table at Thanksgiving before or after the meal. (pdf) Perhaps you could just use it as a discussion guide to provide stimulus for other's reflections. 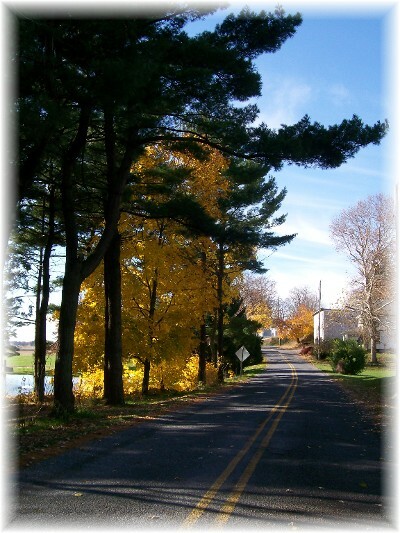 A Thankgiving prayer: (written by Joe Sherer, a pastor friend of ours and shared as the benediction at our community Thanksgiving Eve service several years ago.) Webpage For those who enjoy written prayers this would be a beautiful prayer to read together at the Thanksgiving table.